The books and reading is important for children of every age. The more they will read recommended and must read books, the more they will learn and gain. Actual learning of kids starts when they start reading books. The parents should develop the habit of reading in their children at very early ages as it will built connections in the brain that promote language development. They gain a lot of knowledge and improve their level of understanding. Below are some solid reasons for why reading is important for children. As the kids will read more books they will find different new words each day. Use of these words in their daily conversation will help them improve their vocabulary. Correct way of reading with the use of proper grammar will help them improve their reading skills. Daily conversation using the new words will improve their pronunciation as well. The more they will read the books for a particular language, the more they will get command on it. The language improvements help them in speaking of that particular language. Hence it improves speaking skills as well which is very necessary in classrooms. It is proved in the scientific research that the reading helps in mind development of the children. As soon as they starts reading must read books, it becomes easy for them to understand the situations and concepts. 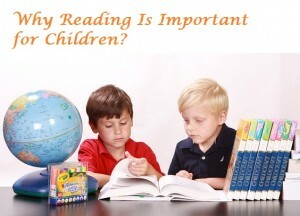 While reading books, children go through the different concepts and information. Books are very good source of important information related to the world, social, environmental issues and many more. Through books, they come in contact with new experiences and find new ideas as well which further helps them in their future. Definitely, reading of ultimate books will improve their knowledge. And it is obvious that if you have good knowledge, you are more confident in front of the others. It will help them in more participation in the classroom as well. Books are helpful in enhancing the social skills and values in children. In most of the books, the authors try to write in terms of situation. When the children face the same type of situation in their daily life, they will do the same what they have read in the book. With this they know about the social values and ethics. For example, you and your friend have purchased different books. After reading your own book, you can exchange it with your friend or you can discuss about the concept or story with them. It helps in building strong relationships and trust.